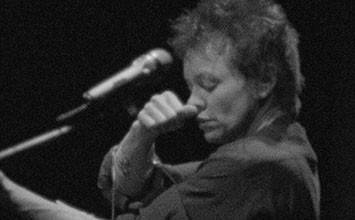 The below artworks are the most important by Laurie Anderson - that both overview the major creative periods, and highlight the greatest achievements by the artist. Artwork description & Analysis: Handphone Table is one of Anderson's earliest sculptural pieces. The work consists of a five-foot-long table incorporating a concealed sound-system which, in turn, emits low range vocal tones through one end of the structure and instrumental music at the other. Just like the sound-system that produces them, however, these sounds are hidden inside the work and are inaudible in the absence of a viewer. In order to access them the audience must not simply be present but actively engage with the sculpture by positioning his or her elbows onto two depressions on the tabletop and using their hands to cover their ears. Sharing wood's porous properties, the bones of the listener begin to serve as conductors which allow for the sound to travel through the arms to the ears and allow Handphone Table's music and poetry to be heard. Anderson has said that the work was inspired by an experience she had whilst resting her head on her hands while using an electrical typewriter. More than a sculpture, Handphone Table is an investigation into both sound and materials, informed by the artist's own musical training. But the work achieves also something else: it breaks with a tradition wherein the object of art is something to be looked at. In a manner similar to Anderson's later performances the body is made to function here "as a working part of the machine", as Erin Striff writes or, in this case, as a musical apparatus. "I tried to be as quirky as I could," Anderson has said in relation to her early practice, elsewhere noting that, "at that time none of us thought we would ever be professional artists or that anyone would ever pay us for doing any of this. So it was this really crazy innocent moment". The work can therefore be said to represent the experimental scene and atmosphere in early 1970s New York, with precedents in the Dada movement, such as Marcel Duchamp's With Hidden Noise from 1916. Artwork description & Analysis: United States I-IV is a seven-hour-long multimedia performance that combines earlier versions of her performance United States with newly developed material. An audio recording of the performance was subsequently released as a 5-LP album by Warner Brothers. The performance, which combines text, music, photography, film, and projected drawings, is thematically organized into four sections: 'Transportation', 'Politics', 'Money', and 'Love'. While the different sections "share many recurrent images and musical motifs" writer and critic Stephen Holden points out that the sensation is similar to "driving across the country from East to West, with no specific destination in mind." Anderson's United States is often praised for the "heterogenous mixing of genres", and for being ahead of its time in its ambitious combination of musical performance, projection and written text. It's combination of forms was an inspiration to performance artists in terms of scale and potential, and to musicians inspired by its careful and detailed coordination between visuals and music. 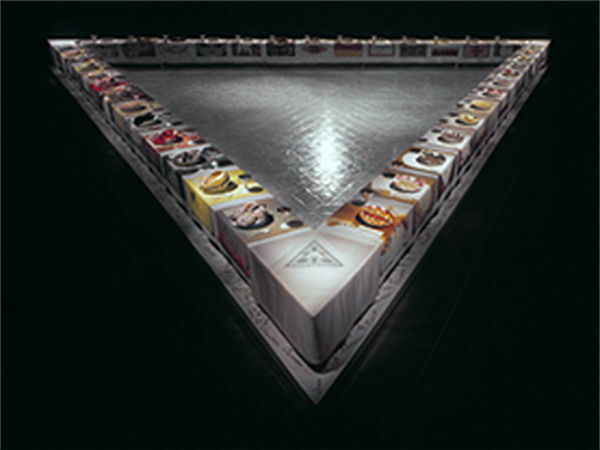 RoseLee Goldberg suggests that United States I-IV is most significant in the fact that the performance was still "accessible to mainstream audiences" despite being highly experimental and innovative, and that Anderson's achievement of "crossing from avant-garde obscurity into the so-called mainstream without compromising her ideas or aesthetic integrity' would ensure the performance's continued significance in the 'annals of art history". In terms of content, United States presents its audience with common phrases and expressions which within the context of the performance are left devoid of meaning and perhaps rendered threatening. Even the things we do and say habitually, all the simple gestures we often take for granted, carry with them, for Anderson, the potential to be misinterpreted or, worse, emptied of all meaning. The performance also alludes to NASA's launch of the Voyager 1 and 2 spacecraft in 1977, which carried with them recorded sounds and images selected by a committee chaired by cosmologist Carl Sagan. The contents were intended, as President Jimmy Carter enclosed message read, as "a present from a small, distant world, a token of our sounds, our science, our images, our music, our thoughts and our feelings. We are attempting," he wrote, "to survive our time so we may live into yours". As with much of Anderson's work, humor is an important element in United States I-IV. This is something she acknowledges herself in the performance with the line "I see myself as part of a long tradition of American humor." And yet, as theorist Kathryn Van Spanckeren argues, "despite its humor, Anderson's work, like Kafka's, is full of metaphysical angst...To enjoy Anderson, in fact, we find ourselves...laughing at the apocalypse - fiddling as it were, while Rome (America) burns." This sense of angst builds throughout the performance towards the conclusion that "The United States helps, not harms, developing nations by using their natural resources and raw materials". 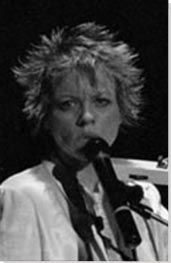 Artwork description & Analysis: In 1989, Laurie Anderson released Strange Angels, her fourth studio album produced for Warner Brothers Records. It was alongside this that the series of videos Personal Service Announcements were produced and aired on commercial music television (particularly MTV and VH1). The artist had been asked by the studio to make a music video, but this was something she found conceptually difficult to approach, and she decided instead to create a series of self-contained video pieces to promote the album. She later admitted that "in the end they had nothing to do with the songs", with Anderson exploring in the series a variety of topics, including women's salaries (she is a founding member of the Women's Action Coalition), military spending and the national debt. The videos were subsequently collated in the 1990 VHS release Collected Videos. It was not only in the choice of topics that the videos differ from more conventional music videos, but also their mode of presentation. In one of the clips, Anderson is discussing the American national anthem from inside the smoky kitchen of a diner, while a cook grills meat in the background. She observes to the camera, "Hey, can you smell something burning? I mean...that's the whole song" - thus jarring viewers out of their typical habits and viewpoints. As with much of her work, here humor is a key aspect of its effectiveness in engaging the viewer. All of the videos in the series deploy humor in their engagement with topical political issues. This series of videos is most notable for the way in which Anderson plays with the form of the music video, and its relationship to popular culture. They are exemplary of her blending of high and low culture, which has been a consistent theme throughout her career. Anderson writes that as America gets more conservative her "reactions to this are driving me further into the politics of pop culture. I want to know what the motor is, what is driving this culture further and further to the right ... The art that I like the most and the art that I aspire to make helps people live this life as well as possible. It is engaged in this world ... This means being involved with the aspirations, lies, and dreams of what is so snobbishly called low culture." Anderson's Personal Service Announcements filter ideas developed within the frame of contemporary art practice through a popular culture lens that encourages the widest dissemination possible. In this they preempt the video-centric engagement with political discourse intrinsic to social media, and artworks which intervene in mass media forms. Artwork description & Analysis: The End of The Moon is a 90-minute-long performance created as part of Anderson's artist residence at NASA between 2003 and 2004. In a similar vein to United States I-IV, the piece explored a number of different topics around contemporary life and culture - from NASA's application of nanotechnology and the Space Shuttle Columbia disaster to consumerism and fear. "Nominally," she explained in an interview, the work "is my official report as the first NASA artist-in-residence, but the stories include things about war, my dog, trees, people I've known, theories." In The End of The Moon the artist exhibits her skill in constructing compelling narratives. An example of this is the story she tells about the time she was "up in the mountains" with her dog, Lolabelle, who was acting strange after encountering wild birds for the first time. Lolabelle, the artist speculates in her monologue, must have realized that "she was prey" and, then in turn that predators can come from the air. "For the remainder of their trip, she would keep looking up, "scanning the thin sky like there's something wrong with the air." But Anderson also references Lolabelle's expression as one that she had seen before: "I realized it was the same look on the faces of my neighbors in New York in the days right after 9/11, when they suddenly realized first, that they could come from the air and second, that it would be that way from now on ... it would always be that way." What begins with the artist recounting a fairly everyday moment involving a dog and their owner soon becomes a powerful analogy for the 9/11 terrorist attacks and their aftermath. Unlike much of her previous work which features extensive use of technology, The End of the Moon employs little more than Anderson's own voice and violin, a set dressed with votive candles and a small projection of a crater on the moon. Talking about the work some time after its completion at a press conference, Anderson explained that in retrospect she came to understand that the piece was, in fact, one primarily about loss. When asked what this loss referred to, Anderson responded that "I wrote this text when we began the war with Iraq," and that she finally realized in attempting to answer the question, that "what I had lost was my country." Artwork description & Analysis: Anderson's installation The Waters Reglitterized presents the viewer with works of art developed from dreams. "For the last year," she explains in relation to the work, "I've been on the road with a solo performance. Every night another theater, another hotel room. As the months went on my dreams became wild, relentless. Headless singing squirrels, vast spaces, bizarre clatterings, I began to draw these dreams literally out of self-defense. The more I drew, the more they began to look like notes towards a bigger picture." Comprised of drawings, prints and video-work, the installation, as art-critic Charlie Finch notes, takes its title from an essay on painting by Henry Miller written for his friend Emil Schnellock in 1949. Miller writes "Before falling to sleep last night I ordered my subconscious mind to remember, on waking, the last thought in my head -- and it worked." Like Miller, Anderson attempts with The Waters Reglitterized to remember and navigate her own dreams. For her, dreams are "more than just pictures but portrayals of physical sensations and emotions." This is something she expresses most aptly in the drawings included in the installation which have an almost fluid quality and feature warm, saturated colors. For example, in Fox, the artist's video work for the installation, Anderson focuses on a dream she had the summer before exhibiting the work in 2005. Here, as Finch describes, "we see the back of Laurie's head under a red velvet curtain watching her brother photograph a woman's corpse on the floor of a hotel lobby while a fox circles and sniffs the body. Crinoline and chicken wire frame the scene like sashes and wallpaper in a Vlaminck." While Anderson never shows her face during the video, her movements suggest that she is confused by the scene - she appears, from the back, to be rubbing her eyes - reproducing the experience she wakes up. The dream, filled with surrealist imagery, is not one that is as difficult to decode for the audience as the artist. Kiki Seror relates the female corpse in it to the one which features in Duchamp's final work, Étant Donnés, "only she's clothed out of respect." Yet the exact meaning of the dreamscape remains a mystery. "Every viewing washed and deluminated this masterpiece," Finch finally writes of Fox, "like one of Henry Miller's watercolors, but our hunger for clues was unabated." Artwork description & Analysis: Habeas Corpus is a collaboration between Laurie Anderson and Mohammed El Gharani consisting of a video installation and soundtrack. Gharani is a former Guantánamo Bay prisoner whose story Anderson first discovered through the human-rights organization Reprieve. First arrested when he was just 14 years old, Gharani spent 7 years imprisoned, before his charges were dropped in 2009. In Habeas Corpus, he is present through a live video transmitted from West Africa, interspersed with a series of pre-recorded clips and projected onto what Anderson describes as a large, white "film sculpture" - a cast which ecohoes Gharani's seated shape three times bigger than life size. This scale was inspired by Lincoln's Memorial in Washington D.C. The piece is accompanied by swirling drones made for the performance by Anderson's partner Lou Reed. Despite his innocence - he was first imprisoned for "being in the wrong place at the wrong time" - Gharani, like other former Guantánamo detainees, is not permitted to enter the United States. This contradiction is at the heart of Habeas Corpus, the title of which refers to the legal term for a person's protection against unlawful imprisonment and which means "you shall have the body" when translated literally. This piece delivers the audience Gharani's body digitally, exploiting the uncanny possibilities of simultaneous video link. Anderson has worked on projects exploring similar themes since the 1990s, a concept that she calls 'telepresence' and offers prisoners a kind of virtual escape or infiltration. This is made clear by the fact that Gharani is able to not only exist within the space of the United States in the performance, but to communicate with visitors, whose experience was transmitted to West Africa through a camera. For most of Habeas Corpus Gharani sits motionless and silent - "conjuring," as critic Will Hermes writes, "something of what solitary confinement might feel like." As a prisoner, he was often subjected to solitary confinement, as well as to torture. When, once every hour, his silent image is replaced by pre-recorded clips of Gharani speaking, his occasional smile reveals a broken tooth that was the result of beating during his imprisonment. In a memorable instance from one of these pre-recorded sessions, the former prisoner tells the audience about saving bits of soap so that he could write on his prison door in order to learn English. Adding another layer of meaning to the work is, finally, the knowledge that the Armory's Drill Hall, where the installation was presented, was once the locus of military exercises.